Don't fall for fraudulent phone donation solicitations. The Vigilance Hose Co. #1 does NOT solicit donations via phone calls. Our annual fund drive is sent through the mail and will have identifying photos of our organization. You will be seeing our donation request in the mail shortly, you may have already received yours. Any donation made via a phone call will not benefit the firefighters of the Vigilance Hose Co #1 AT ALL. There are many scam organizations that misrepresent themselves as "the volunteer firefighters fund" or " "fire fighters assistance fund" most of the companies associated with these calls donate very little to any fire department or EMS organization. 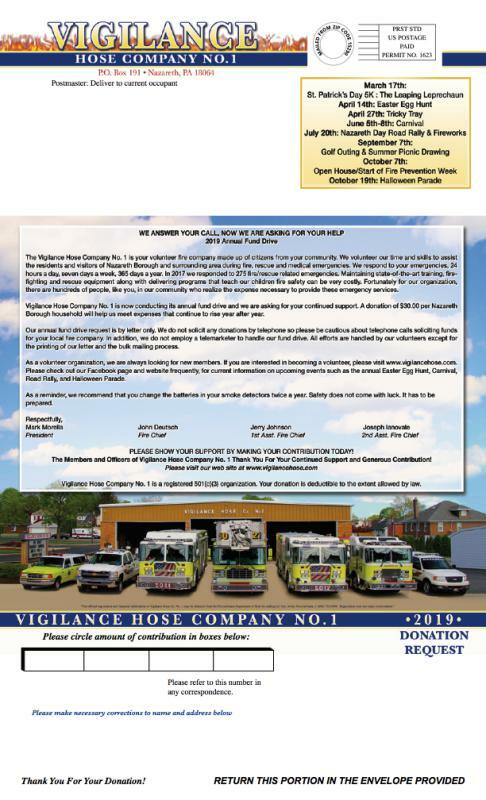 If your donation isn't made to "The Vigilance Hose Co. #1, then the donation does not support your local fire department at all. If you are able, and would like to donate to the Vigilance Hose Co. #1 , it is best to do so via the mailer that will be sent out. or you can call 610-759-2540 and leave a message with your contact information and one of the fire department administrators will contact you with information on how to proceed. Thank you in advance. The Vigilance Hose Co. #1 is a 501 (C) (3) organization so your donation is tax deductible.